We took down and put away Christmas this morning, and ended up eating a late breakfast. Last Pats game of the regular season today, and I thought I'd make some things that would be easy to snack on in front of the tv. These go together quick if you do them assembly line style, and it's a good payoff in the end. Sticky, meaty, sweet deliciousness. I make sure to do the clean up right away before everything hardens. Heat oven to 375. For easier clean up, line a baking sheet with foil or parchment. Top with a baking rack lightly sprayed with nonstick cooking spray. Because I'm just getting back into the kitchen after hand surgery, my usual cookie baking bonanza wasn't going to happen this year. We have a gathering on Christmas Eve of about 15 people and I bring a tray to pass. I figured the best way to get a good variety was to focus on recipes that I could bake in 13x9 pans. I prefer Betty Crocker cake mixes, and those have now been reduced to 15.25 oz. My friend Carol shared a cake mix upsizer and it worked perfectly in this recipe. Thank you to Serve at Once for sharing the recipe! There are just some nights when you shouldn't attempt a new recipe. Last night was one of them, but I stubbornly clung to my planned menu. .
My first problem- I couldn't find refrigerated hashbrowns, so I bought the frozen ones, a 30oz bag. I eyeballed 20oz and defrosted them in the microwave. Next issue- despite having a dozen pie pans, none of them are deep dish. I went with a Pyrex. When I put the crust into the oven, a major homework meltdown occurred and I was distracted and forgot to set the timer. I am guessing that I shorted the time the crust should have baked by about 5 mins based on how long it took to cook through in the end. It's beginning to look a lot like DONUTS! :) Struggling a bit with my Christmas spirit this year. I decided to play some cheerful music and bake a nice treat for breakfast. I knew I wanted donuts, but I couldn't decide on a flavor- eggnog? peppermint? Nope, I wanted gingerbread and I had these on my donut Pinterest board from Pinch of Yum. No changes to this one, except that I cannot remember adding the maple syrup. The minute I stepped into the kitchen, I was swarmed with people needing answers to urgent questions that apparently I only possess the answer to. I know I did, the lid was off and I had a measuring spoon with remnants in it, but whether I added it to the batter or the glaze, I have no idea. So happy to be getting back into the kitchen a little. I've been recovering from hand surgery and though I was prepared with frozen and quick fix meals, I was unprepared for how much I'd actually miss cooking. The guys have done a great job helping out and yesterday I decided they deserved a little treat. I needed a side dish to go with pasta and had a can of Pillsbury Crescent Rolls kicking around the fridge. I knew that I wanted to stuff them with cheese, and have seen lots of recipes around using a cheese stick. I didn't have any on hand, so I used shredded mozzarella (part skim). For the topping, I combined Penzey's Brady Street Cheese Sprinkle and melted butter. They came together quickly, baked up quickly and were delicious. I did have some cheese oozing issues, so next time I may give the cheese sticks a try. Preheat oven to 375º. Spray a baking sheet with nonstick cooking spray. I swapped the onion for dried onion and jarred garlic instead of fresh. I also decided to add the mustard in with the beef mixture. He's not a huge fan and if it was visible he might have balked. I used a sharp shredded cheddar for my cheese. Easy, fun and the grownups enjoyed it too! We're having unseasonably warm temps in New England the last few days. I saw this recipe on Pinterest and despite that fact that it was going to heat up the house, I couldn't resist. Instead of boiling the brown sugar/butter mixture on the stove, I put both into the cake pan and into the oven while it preheated. By time I'd mixed the batter ingredients and sliced the apples, it was ready to go. I had 2 nice sized honeycrisp, and I sliced them about 1/4" thick and overlapped them in a pretty design. My cake baked in exactly 50 mins, and and some point I realized that I'd forgotten to grease or spray the sides of the pan. I got lucky, I ran a knife around the edge and I only had minor sticking. I did not make the whipped topping, it was a fantastic cake without it. Thank you to Alyssa at The Recipe Critic, this one is "I don't care if it's nearly 80 degrees out, I have to bake this cake" good. Fall is my favorite season. Apple picking, cider, cozy sweaters, comfort food. But this is New England, and today summer decided to make a comeback. I had this meal on the menu and it turned out to be the perfect choice- it tasted like fall, but was quick and easy and didn't heat the house up. I buy thinly sliced chicken breasts and that saved me the trouble of pounding and plastic wrap. I only had a 1/2 cup of chicken broth, so I upped the amount of cider to make up the difference. I used minced dried onion and dried herbs, it's what I always have on hand. For a side, I made couscous, replacing the recommended amount of water with cider, and finishing it with some thyme. This was a big winner here, even my picky kid ate it and asked for seconds. Thank you Simply Scratch for this new family favorite! This is very similar to a dish I made a while back. I changed up some of the ingredients based on what I had on hand. Measurements are estimated, I rarely measure shredded cheeses or sauce. I used about 1/2 of a 26 oz jar. Italian Herb Mix from Penzey's is my go to for this type of dish, you can certainly sub Italian seasoning or your favorite blend. This also would be great with some browned ground beef or Italian sausage! A lot of the pictures I see out there show the majority of the roll uncovered by sauce. I am always afraid of winding up with crunchy pasta that way. 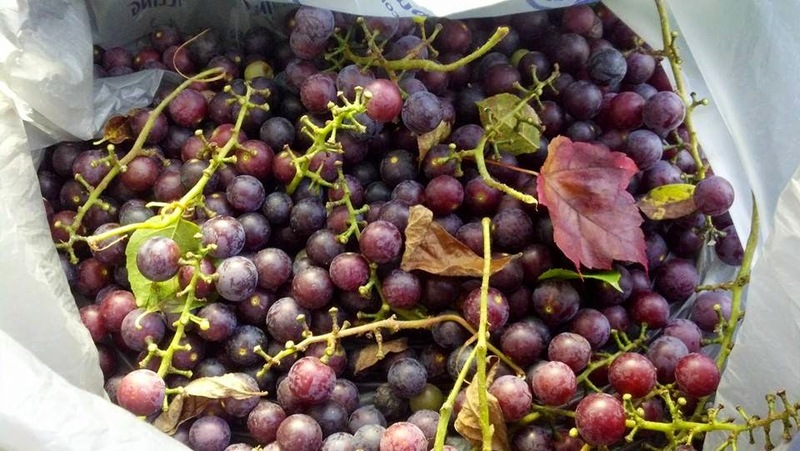 We took my son out over the weekend to shoot his bow, and my husband stumbled across a treasure trove of Concord grapes. Luckily we had a little cooler, and he filled it up pretty quickly. I spent a while picking through, taking out the leaves, sticks, and critters, and then scurried to find a recipe. I ended up going with this one from Sure Jell/Kraft. It calls for a LOT of sugar, but a good portion of the grapes we picked seemed to be underripe, so I wanted to make sure the resulting jelly was edible. This one is a blast from the past! I submitted these as my entry in 2007 to the Derryfest Cookie contest. I was narrowly beat by a very common cookie, and when I realized how much 'politics' was involved in the judging, I stopped entering. I have been craving chocolate for a week, but we had a sudden surge in temperatures that killed any desire I had to bake. Finally, the temps today were nice and I assembled my ingredients to make these amazing looking cookies. FOUR kinds of chocolate? Oh yeah, I'm in. I doubled the recipe, cookies disappear fast around here and 17 didn't seem like a lot. I ended up using Hershey's Special Dark chips for the dark chocolate and I didn't chop them. I used a cookie scoop to keep them all uniform, and I flattened them with the glass after I pulled them from the oven. So deliciously, chocolatey good. Both myself and my husband both think they'd be fantastic as an ice cream sandwich with some vanilla bean ice cream. Thank you so much to Averie for satisfying my chocolate craving! Tim keeps craving pasta, I keep craving pizza and I ran across this recipe from Damn Delicious that was going to cover both of those cravings perfectly. My husband doesn't eat breakfast and barely eats lunch, so I wanted to make sure that dinner was sufficiently hearty enough for him. I used the entire package of Johnsonville Sweet Italian Sausage (19oz). To account for the increased volume in the pan, I also added a second can of tomato sauce. This led to increasing the spices, and I always toss in a pinch of brown sugar with any red sauce. Life is too short to measure cheese, I just put a nice handful over the top. After I took the dish out from underneath the broiler, I gave it a sprinkle of Penzey's Italian Herb Mix and on my own serving I used some crushed red pepper flakes. At the moment, chicken seems to be the most affordable protein out there. We've always eaten a lot of it, but now it can be as much as 2x a week. Unfortunately, Jake's school has seemed to come to the same conclusion, and it's on the menu there 2 to 3x a week also. I've got zillions of chicken recipes saved, and when I went looking for a fried Chinese style dish, this one popped right up. Few minor changes to the ingredients- dried onions for the fresh, fresh ginger for the dried. My orange juice had been squeezed a while back and frozen in ice cube trays, and the zest was long gone, used in another dish. I used Penzey's dried zest instead. Meals have been a challenge since my son started back to school. I think we've finally gotten into a groove now, going over the school lunch menu and my home menu and making sure there is some variety. This week's menu had been planned, but wasn't quite right when my friend Sue shared she'd be making these Cheeseburger Quesadillas for dinner. That was my missing piece! A few tweaks. I had a little over a pound of ground beef. The guys will not eat real chopped onion, so I used Penzey's dried and added to the beef while it cooked. The recipe doesn't say to drain off the grease, but I did since mine had a pretty high fat content (85/15). I used real bacon, microwaved til crisp.